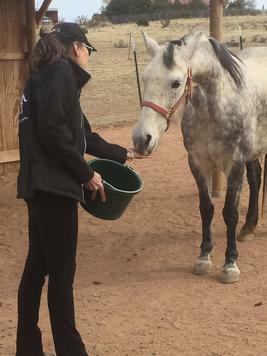 Queenie (aka Nizhoni) is the horse that inspired the forming of The Chance For A Lifetime. She will also be the first to graduate from the program! 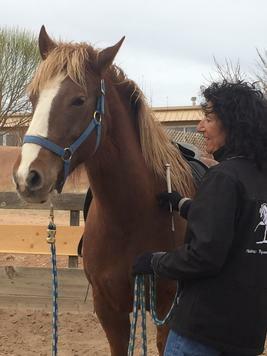 Once a wild horse, Queenie was rounded up with the rest of her band when they strayed onto private property. 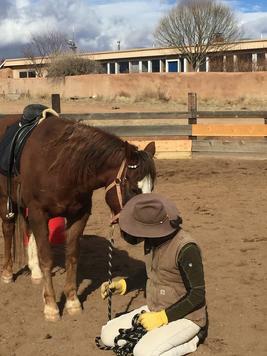 During her training she developed several issues with soreness that were not addressed until she bucked off her adopter - which was totally out of character for this mellow mare. In our search to find answers for Queenie we found Erica and Joost. They were willing to work with the vet, the chiropractor, the massage therapist to help Queenie overcome her physical issues and her now deep distrust of humans. Queenie entered training in 2017 and is now ready for Adoption. We will be announcing Queenie's availability soon! Paddy is the second horse to enter The Chance For A Lifetime program. While we don't know much about his past, we do know he was rounded up by Gallup and was roped several times, enough to make him very afraid of any ropes or arms that go up in the air fast. Prior to being rounded up he had been chased with ATV's. Severely traumatized, Paddy spent many months here learning to tolerate people and tractors even being around him. Despite our efforts we were unable to find the right trainer for him. Meanwhile volunteers worked with him to re-establish trust. We had some success, but we knew he needed special hands to help him break out of his shell if he was ever going to have a real life with his own special person. Since coming into The Chance For A Lifetime he has made progress toward not only tolerating, but even looking forward to seeing a human! Paddy will be in The Chance For A Lifetime for at least a couple more months, then we'll re-evaluate. Your generous support for Paddy's continued training would be VERY appreciated. Emerald came to FCER when she was rescued from the Kill Pen at a Livestock Sale Barn. She was pregnant at the time, and soon gave birth to a colt, who got very ill. In our efforts to save the life of the baby, Emerald had to endure us in her pen and with her child to medicate him. It was not easy for her. Already illusive and shy beyond reason, she was faced with dilemma of tolerating us, sometimes visibly shaking. We did save her son, and he has gone on to a new home. Emerald (aka Emmy) would be here for 4 years while we searched for answers for her. And now we found it! She has flourished under the care and guidance of Erica and Joost! Emmy so impressed one visitor that she paid for 2 months of training! 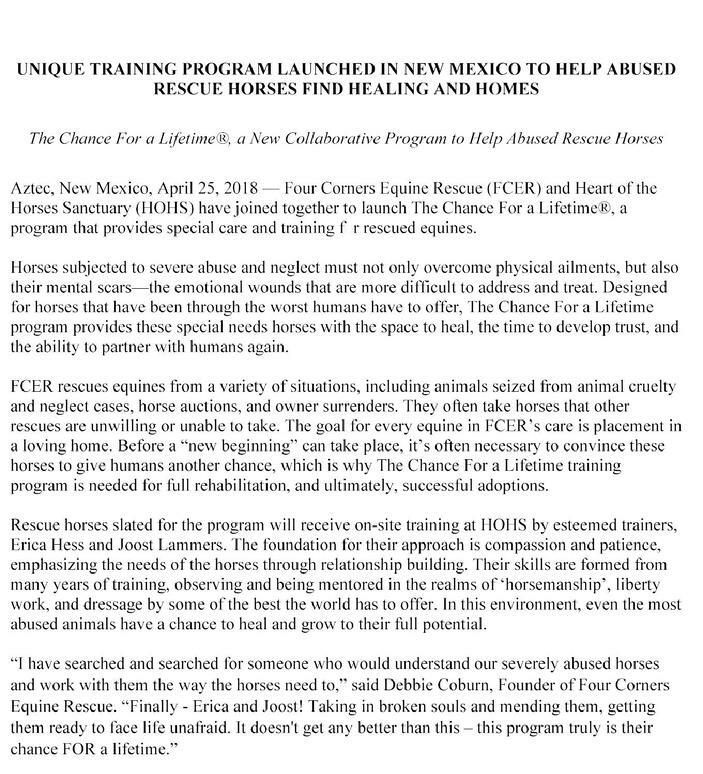 The Chance For A Lifetime program is based on what the horse can do, and there is no rushing success. Much patience is required to repair the damage done. Please help support Emerald in her quest to overcome fear.